Is Nokia Destined for Greatness? Every investor can appreciate a stock that consistently beats the Street without getting ahead of its fundamentals and risking a meltdown. The best stocks offer sustainable market-beating gains, with improving financial metrics that support strong price growth. Let's take a look at what Nokia's recent results tell us about its potential for future gains. The graphs you're about to see tell Nokia's story, and we'll be grading the quality of that story in several ways. Growth is important on both top and bottom lines, and an improving profit margin is a great sign that a company's become more efficient over time. Since profits may not always reported at a steady rate, we'll also look at how much Nokia's free cash flow has grown in comparison to its net income. A company that generates more earnings per share over time, regardless of the number of shares outstanding, is heading in the right direction. If Nokia's share price has kept pace with its earnings growth, that's another good sign that its stock can move higher. Is Nokia managing its resources well? 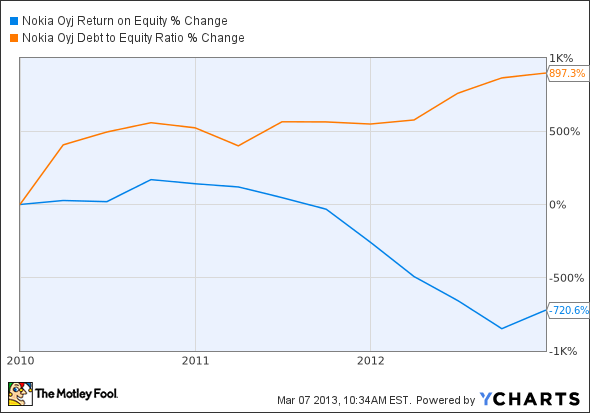 A company's return on equity should be improving, and its debt-to-equity ratio declining, if it's to earn our approval. Healthy dividends are always welcome, so we'll also make sure that Nokia's dividend payouts are increasing, but at a level that can be sustained by its free cash flow. NOK Total Return Price data by YCharts. Source: YCharts. *Period begins at end of Q4 2009. NOK Return on Equity data by YCharts. Source: YCharts. *Period begins at end of Q4 2009. 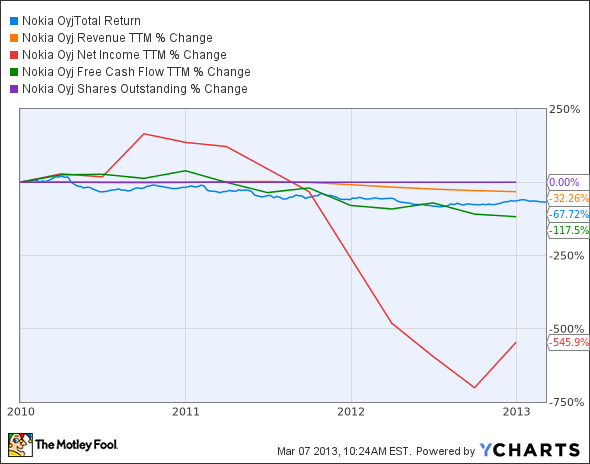 N/A = not applicable; Nokia suspended its dividend in January. It should come as no surprise that Nokia's endured a particularly brutal stretch over the past three years. Nokia can only earn eight passing grades as a result of its recent dividend suspension -- which may help boost the company's shrinking cash pile this year, but which also results in a failing grade as far as dividend growth is concerned. Out of these eight opportunities, the Finnish phone maker earns merely one passing grade, and then mainly by technicality. Is there hope for a turnaround in 2013, or is this former high-yielder hopeless in the near term? I came together with two of my fellow Fools to predict Nokia's outperformance last summer, based largely on the fact that it was undervalued from a fundamental standpoint. After initially being rewarded with a big bounce into the new year, we've had to endure a rough patch in 2013. My fellow Fool Sean Williams gave Nokia a rough valuation range of $3.53 to $3.66 per share based on patents and other holdings, and as of this writing it's still above that level in spite of its 2013 slide. That seems to indicate a limited upside on a fundamental revaluation level, but by now the market has shifted its expectations toward smartphone success -- or failure, if the year's decline is any indication. The breakdown of mobile market share does not tilt in Nokia's favor at present. Google's Android and Apple's iOS combined for over 90% of the smartphone market in the fourth quarter. Nokia, which is leaning on Microsoft's Windows Phone, shipped 4.4 million Lumias, which dominated the tiny slice of Windows Phone smartphones in the market last quarter, but was still not enough to surpass the fast-fading BlackBerry. Nokia has at least one advantage over Apple (though this may not be as much of an advantage over Android phone makers): extensive experience in lower-cost devices. Forget about feature phones -- Nokia can push out smartphones running Windows at a lower cost than many competitors. Apple struggles in unsubsidized phone markets because the cost of most Android headsets is so much lower than that of the iPhone. The Lumia line, with its striking design features (a hallmark of Nokia's success in the pre-smartphone era), has the potential to capture significant mindshare in emerging markets like India and China. Nokia hasn't abandoned feature phones, either. Starting emerging-market users off with a $20 or $80 feature phone could be a smart brand-building strategy, especially if it transitions users to more lucrative entry-level smartphones. Apple may be seen as an aspirational brand, but that status is far from assured if the company fails to move forward in terms of design and functionality. Fashion is a fickle thing, especially when that fashion is too costly for the consumer. Nokia is a big fish in the tiny Windows Phone pond right now. It can remain a big fish if the pond grows, but a dry season might suffocate it. This year will be a very important one for the company's future, but that future remains far from clear. Today, Nokia has few of the qualities that make up a great stock, but no stock is truly perfect. Digging deeper can help you uncover the answers you need to make a great buy -- or to stay away from a stock that's going nowhere. The article Is Nokia Destined for Greatness? originally appeared on Fool.com. Fool contributor Alex Planes holds no financial position in any company mentioned here. Add him on Google+ or follow him on Twitter @TMFBiggles for more insight into markets, history, and technology.The Motley Fool recommends Apple and Google. The Motley Fool owns shares of Apple, Google, and Microsoft. Try any of our Foolish newsletter services free for 30 days. We Fools may not all hold the same opinions, but we all believe that considering a diverse range of insights makes us better investors. The Motley Fool has a disclosure policy.